This is a die-cut flange Pearl Oil porcelain sign. 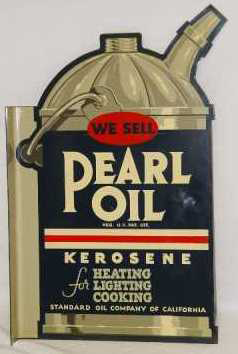 This particular Pearl Oil sign is shaped and colored like a can of Pearl Oil Kerosene. It reads, “We Sell Pearl Oil Kerosene, For Heating, Lighting, Cooking, Standard Oil Company of California” and features blue label with white text.